Boxers are athletic, energetic and active dogs, with a loyal temperament. In order to maintain a healthy heart and immune system, they may benefit from special nutritional care. Eukanuba Boxer is a complete and balanced daily food designed to help keep a Boxer's heat healthy and to support the strength of their immune system, keeping them healthy and active. Please visit our Breed Facts and Information for the Boxer. Recommended For: Adult Boxer (1+ years). Also suitable for Rottweilers, English ; Irish Setters and Doberman Pinschers, who share the same nutritional needs. Dried Chicken And Turkey (29%, A Natural Source Of Taurine, Glucosamine And Chondroitin Sulphate), Maize, Wheat, Animal Fat, Sorghum, Barley, Dried Beet Pulp (2.9%), Hydrolysed Animal Proteins, Dried Whole Egg, Potassium Chloride, Sodium Chloride, Fish Oil, Sodium Hexametaphosphate, Calcium Carbonate, Fructooligosaccharides (0.29%), Linseed. Vitamin A (45672 IU/Kg), Vitamin D3 (1516 IU/Kg), Vitamin E (254 Mg/Kg), L-Carnitine (48.4mg/Kg), Beta-Carotene (28.6 Mg/Kg). Contain Basic Cobaltous Carbonate Monohydrate (0.49 Mg/Kg), Cupric Sulphate Pentahydrate (46 Mg/Kg), Potassium Iodide (3.4 Mg/Kg), Ferrous Sulphate Monohydrate (615 Mg/Kg), Manganous Sulphate Monohydrate (46 Mg/Kg), Manganous Oxide (33 Mg/Kg), Zinc Oxide (214 Mg/Kg). 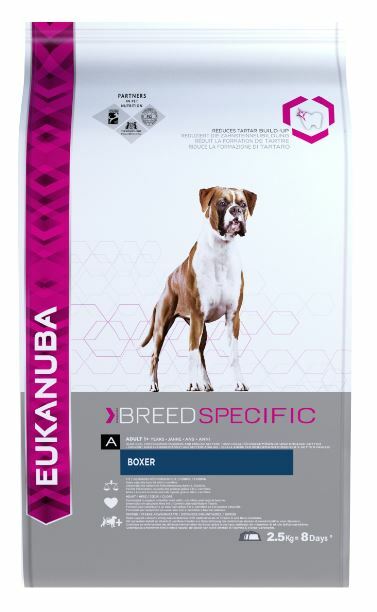 There are currently no questions for Eukanuba Adult Boxer Dog Food - be the first to ask one!